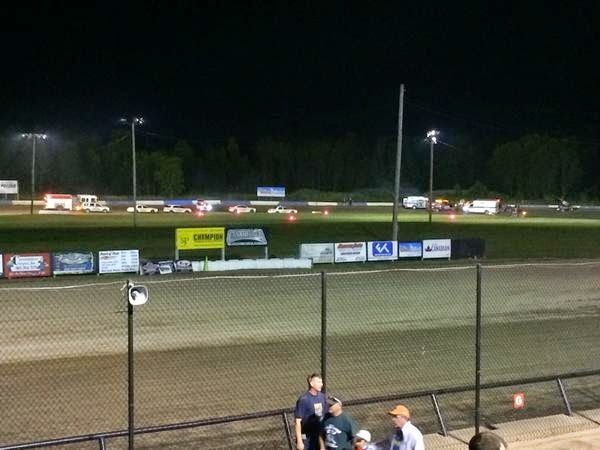 The Ontario County (N.Y.) Sheriff's Department confirmed early Sunday morning that a sprint car driven by NASCAR driver Tony Stewart struck and killed another driver who was standing on the track while a race at Canandaigua (N.Y.) Motorsports Park was under caution. Sheriff Philip Povero confirmed during an early-morning news conference that the driver struck on the track was pronounced dead on arrival at F.F. Thompson Hospital in Canandaigua. The driver was identified by track officials as 20-year old Kevin Ward Jr. of Port Leyden, N.Y.
Povero said authorities questioned Stewart at the scene and said he was cooperative and "very upset" about the incident. The Ontario County district attorney's office has been notified of the incident and will continue the investigation, Povero said. The are no charges currently pending against Stewart, who returned after the incident to his motorhome at Watkins Glen (N.Y.) International, site of Sunday's Cheez-It 355 at the Glen. At approximately 10:15 a.m. ET Sunday, Stewart-Haas Racing's vice president of competition, Greg Zipadelli, said Stewart had decided not to compete in Sunday's race. "He feels strongly this is the right thing to do," Zipadelli said of Stewart, with whom he has worked for 18 years. "It's an unbelievable tragedy. Very tough, very emotional." Stewart was expected to return to the Charlotte area. “There aren’t words to describe the sadness I feel about the accident that took the life of Kevin Ward Jr. It’s a very emotional time for all involved, and it is the reason I’ve decided not to participate in today’s race at Watkins Glen," Stewart said in a statement released shortly after the start of Sunday's race. Zipadelli said Nationwide Series driver Regan Smith was on his way to the track and would drive Stewart's No. 14 Chevrolet in the race. Because of the driver change, Smith will start from the rear of the field. "A tragic accident took place last night during a sprint car race in which Tony Stewart was participating. Tony was unhurt but a fellow competitor lost his life. Our thoughts and prayers go out to his family and friends. We're still attempting to sort through all the details and we appreciate your understanding during this difficult time." Video of the incident shows Stewart's car striking Ward's while racing in a turn. Ward's car then spun and bounced off the wall, placing the race under caution. Ward quickly exited his car and is shown walking down the track while pointing toward Stewart as he comes back around the track. The right side of Stewart's car strikes Ward, dragging him briefly under the car and then leaves him lying prone on the track. According to the track, all racing activities were halted for the night following the incident and fans were asked to return home. "Canandaigua Motorsports Park will not have an official statement on the accident that happened in the ESS race until tomorrow. Please pray for the entire racing community of fans, drivers and families." Canandaigua Motorsports Park is a half-mile dirt track southeast of Rochester, N.Y., and about 50 miles northwest of Watkins Glen International. In recent weeks, Stewart has returned to dirt track racing after a breaking two bones in his right leg in a wreck at a dirt track in Iowa last summer. Video's out on YouTube, shot by a fan in the stands, but be warned, it's NOT something you want the kids to see, and you'll wish you hadn't seen it once you do. I know I do and I covered Motorsports for over a decade on the West Coast..
Well said, Tony. I watched it and then wished I had not when it was confirmed that he died. I believe YouTube took it down, but I'm sure people are re-uploading it. Tony should have learned from his sprint car crash last year, but obviously didn't. Now comes the LAWSUIT. Th e lawsuit is the least of Tony's concerns. He won't be leaving NY before being arraigned. And NASCAR should not let him race today. Alot of folks are saying Tony stomped the throttle......and that indicates his intention to hit Mr. Ward......Sprint Cars don't turn like normal racecars....you have to put some throttle in it to turn.....Sad,situation. Even as much as I dislike Tony for his antics, I do not believe he would have EVER hit a driver outside of his car intentionally! . I'm sure that's what he will tell the judge when he gets sentenced. wrknl8 - that's what people want to think, but life has taught us when confronted with evidence a person would stoop lower than low we are wrong to deny said evidence. Stewart was 100% responsible here - he had responsibility to avoid hitting Ward (like all the other drivers did) and he chose not to accept that responsibility - then he intended to race at Watkins Glen as if nothing had happened (Greg Zippidelli issued a press release that morning stating it was "business as usual" before suddenly withdrawing around 12 PM, as though he had to be persuaded by someone else not to race. We need to face the possibility that Stewart indeed is no better a person than OJ Simpson. Tyler Graves, a sprint-car racer and friend of Ward's, told Sporting News in a phone interview that he was sitting in the Turn 1 grandstands and saw everything that happened. "Tony pinched him into the frontstretch wall, a racing thing," Graves said. "The right rear tire went down, he spun on the exit of (Turn) 2. They threw the caution and everything was toned down. Kevin got out of his car. … He was throwing his arms up all over the place at Tony for most of the corner. "I know Tony could see him. I know how you can see out of these cars. When Tony got close to him, he hit the throttle. When you hit a throttle on a sprint car, the car sets sideways. It set sideways, the right rear tire hit Kevin, Kevin was sucked underneath and was stuck under it for a second or two and then it threw him about 50 yards." i just wish these people to leave the jugement to the sheriff's department and not saying he need's to go to jail. Most people don't need the police to replace their common sense. I think they should completely take down Tony's car for this race. I like your blog but you should try to put in more personal opinion. Check out my blog at Lucas Racing Blog. I think that the should shut down the track and work on improving dirt car safety. Fatal error in judgement to walk on the track and confront Tony. No, he wanted to call out Stewart for wrecking him and Stewart ran over him. There is no such thing as a pedestrian ever being at fault for being run over. Ever. It's 100% Stewart and Stewart deserves to be held 100% accountable. should read "Ward kills himself by stepping in front of Stewart's car, he unbuckled his safety harness climes out of safety cage and runs into moving traffic"
That's not the case, Joe. Stewart ran over him. Period. Ward did nothing wrong and it's Stewart's responsibility not to hit someone who's on foot - and Stewart chose not to take that responsibility. The other cars avoided Ward - Stewart did not. Nobody can make credible alibis for Stewart and people need to just accept that Stewart ran over another human being - and was going to race Watkins Glen (Greg Zippidelli's statement that morning said he would race and it was "business as usual") until around noon Stewart withdrew. Unfortunately Kevin Ward was on pot. I can imagine climbing out of a race car and confronting another driver when you're high! Things move in slow motion. Impaired judgement is what killed Kevin Ward. It is so sad...but should be a lesson for everyone! Wow, Excellent post.Really good providing good information your post .. I liked it and enjoyed reading it. good site. Your post is really good information I liked it and enjoyed it. Keep sharing such important posts.